Exhibits, animals, carnival rides, music and more await locals next week when the Crook County Fair returns. Kicking off next Wednesday evening at 5 p.m. and running daily through Saturday, the fair will offer plenty of attractions that the community has come to expect through the years, and feature some new ones that Fairgrounds Manager Casey Daly hopes people will enjoy. Stressing that the primary goal of the fair is to showcase the community and the talents and hard work of its residents, Daly noted that the event will once again highlight the efforts of the local 4-H and FFA clubs. "The kids work real hard to earn recognition from the community, so we are pretty excited about that," he said. 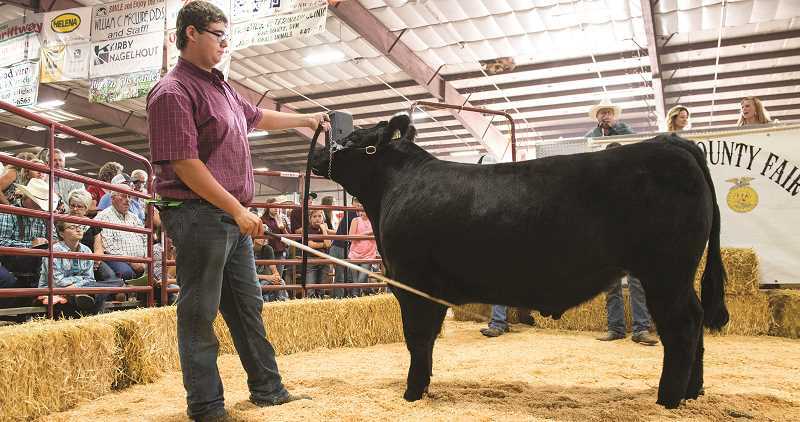 The fair has been on an upward trend in both attendance and participation in recent years, and this year, that has resulted in event organizers increasing the space available for showing livestock. A 40-by-180-foot tent will be erected near the open barns. "We have expanded our vegetable and agricultural displays. Everything is going to be in Carey Foster Hall this year," Daly said. "We just thought there was higher visibility for the people who participate in the fair and the people who come to see the fair." He added that Carey Foster Hall has air conditioning and is a more comfortable venue than the other building the fair has used in the past. The fair kicks off Wednesday evening, as it has for many years, with the Greg Merritt Community Scholarship Barbecue. When Greg Merritt, a well-known and respected local farmer, died of cancer in 2000, his family and friends thought about how best to honor his legacy. Greg and his wife, Gail, had been long-time supporters of the fair and 4-H-FFA auction, and Laine Musil suggested holding a barbeque during the fair to raise scholarship funds. Since 2001, 53 Crook County High School graduates have received college scholarships. This year's recipients are Sarah Connolly, who will study civil engineering at OSU; Luke Flegel, majoring in biological engineering at University of Idaho; and Esmerelda Ortiz-Ventura, who enrolled at COCC to study as a radiology technician. Several attractions will greet fair-goers daily, including the Western Express Railroad and Super Science: Barnyard Adventures as well as a mechanical bull, bounces houses and multiple vendors. "This year, we will have Godfrey, the magician," Daly said. "He is an all-ages show three times a day." The fairgrounds manager went on to single out Buck Trout, a costumed mystery person who will be cruising around the fairgrounds in a decorated golf cart. "He is always in costume," Daly remarked. "He will be entertaining folks, driving around the fairgrounds. We are really excited about that." The fair will also feature multiple contests, including an ice-cream eating contest, multiple dance groups from the community, and a free concert every evening. Country singer Billy Dean is scheduled for Thursday night, and on Wednesday evening, Picnic in the Park will bring its concert series to the fairgrounds, featuring Papa Doo Run Run, a surf music group. "We encourage everyone to wear their favorite beach wear and bring a beach chair," Daly said. "It's good surf music." And after going without a carnival last year, fair organizers were able to land a three-year contract that will bring Idaho-based Fun Time Carnival Company to town. Daly said the carnival will feature rides that will appeal to all age groups from young child to adults. Events scheduled for specific days of the fair include a veterans breakfast on Thursday and wild ewe milking and mutton bustin' on Saturday. And of course, the 4-H and FFA Livestock Sale and FFA Alumni Barbecue will take place that afternoon. "We encourage everybody to come out to the fair and see what our community is all about," Daly concluded. The Crook County Fair will be held Wednesday-Saturday, Aug. 8-11. The fair will take place from 5 to 10 p.m. Wednesday, and 10 a.m. to 10 p.m. Thursday through Saturday.